Here are the top Las Vegas activities during the day! Everyone knows that casinos are the main attraction of the city. However, gambling and nightlife are not the only attractions in Vegas. These ideas include activities within the city, suitable for a couple or a group of adults - best shows, tours and activities that you could du during the morning or afternoon in action-packed, not-just-gambling vacation. While there's no Cirque du Soleil or a major concert that runs in the afternoon, you can find a few inexpensive magic shows that run at 2 pm or 4 pm, that are great for both adults and kids. 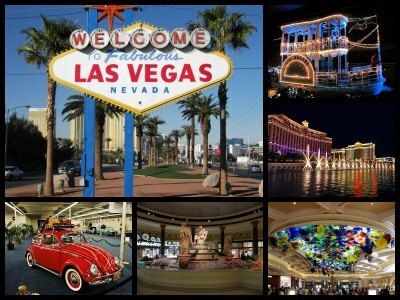 Tours and day trips to various destinations are among the most popular Las Vegas activities during the day. There are over 200 tours to choose from lasting anywhere from only a few hours to an entire day, that take you to many hot destinations in Nevada, California Arizona and even Utah. There are many sightseeing tours that show you the best highlights of the Las Vegas Strip an the best attractions in the city. You can see the Strip from helicopter, ride around Vegas on a hop on and hop off bus, or take a very fun bus of the stars where you will be treated to a show by Marilyn Monroe, Elvis Presley or another impersonator of a famous star. You can also visit the famous Pawn stars shop or take an early morning ride in a hot air balloon. Gondola rides at the Venetian also run since 10 am in the morning. For hungry ones, you can join the Walking Gourmet tour and sample the best dishes at the best restaurants in Vegas. If you like water fun, you can go see Lake Mead, take an afternoon cruise or rent a kayak or canoe. 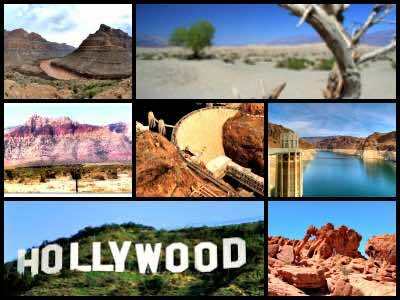 Hoover Dam, Valley of fire and Red Rock Canyon tours are also very popular because they are so close to the city that it's very easy to go and come back very fast if you want to catch a late show or visit a casino. For more adventurous people and those who don't mind high temperatures, there are tours to Death Valley. Before you decide on your Vegas tour, keep in mind that a trip to the Grand Canyon will, most likely, take an entire day and you will be very tired by the end of the day to do other planned activities. There are a few so-called "express tours" by helicopter that are tailored towards those who want to do something in Vegas during the day and come back really fast to catch a show. If you are a daredevil, looking for something extreme to do and are not satisfied with simple sightseeing, Vegas has plenty of fun activities for you for adults and older kids, filled with adrenaline. 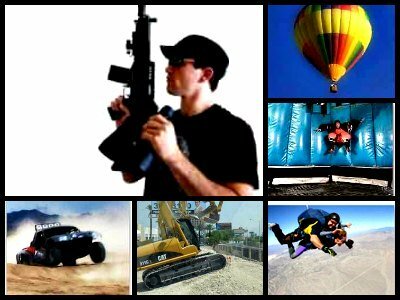 You can ride dune buggies or an ATV, go shoot automatic weapons, ride a horse, or even zoom down the Bootleg canyon by a zipline. Among the most extreme things to do in Las Vegasn during the day you can find tandem skydiving, and Skyjump from the Stratosphere Tower. And of course don't forget amusement parks and thrill rides located right on the Strip. Lines are long, but it's well worth it because the rides are so thrilling. The are at least three places where you can find thrill rides in Vegas - The roller coaster that runs around the New York New York Resort & Casino, Adventuredome located at Circus Circus, and a few very scary thrill rides at the Stratosphere Casino, Hotel & Tower - named appropriately Big Shot, Sky Jump, Insanity, and X Scream. There are more great attractions in Las Vegas for adults that anywhere else in the world! For example, ride up the Eiffel Tower, or the Stratosphere Tower and look at Vegas from above. Exotic cars aficionados would enjoy a visit to Auto Collection at The Link Resort to look at beautiful vintage cars. And if you are into museums, you will have plenty of fun Las Vegas activities during the day. Make sure to grab a Sightseeing Pass if you are planning to do a lot of sightseeing - it will save you literally hundreds of dollars. 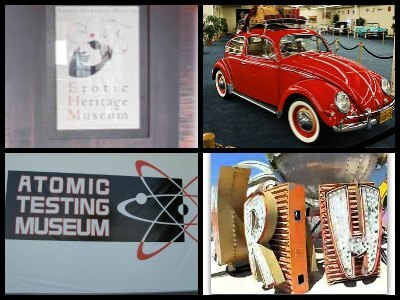 Of these museums, my top choice would be Neon Museum and Atomic Testing Museum - both of them are specific to Las Vegas and will let you understand the city better. I know you want to know about Las Vegas activities during the day for free - and who wouldn't? You have already probably heard about Bellagio Fountains. But that is not all! There are in fact so many great things to see and do in Vegas absolutely for free. On Free Shows page, I guide you through the city along the Strip, from the McCarran Airport towards downtown, stopping at major free attractions and watching all the free shows in Vegas. 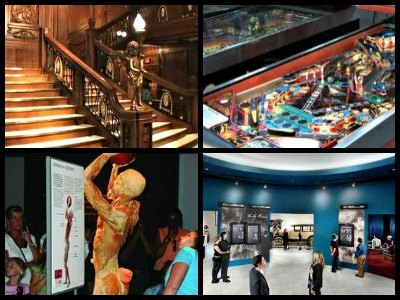 Also check out a few great Vegas attractions not mentioned in the "free shows" guide - M&M World and Pinball Hall of Fame. Think it's impossible to have Las Vegas family vacation with all the adult attractions? Not true! Although the city does cater more to the adult audience, it's still possible to find fabulous fun Las Vegas activities during the day for families with kids - both little ones and teenagers. On my page for families, you will find all the information necessary - from best hotels for families to great family attractions and museums, thrill rides, arcades and anything little kids and teenagers might enjoy. If you enjoy parks, animals and fish - you should definitely start from Shark Reef, Bellagio Gardens and Siegfried and Roy's Secret Garden And Dolphin Habitat - your kids would get a kick out of them! Then explore other options, if you feel like it. If you would like to add a little activity and running around to your vacation with kids, there are plenty of Las Vegas activities during the day for little kids. One of my favorites is Pinball Hall of Fame that is actually like an arcade with pinball machines that you can play. Then there are of course thrill rides at adventure parks, and real arcades. M&M World is more like a store with plenty of candy - although the entrance is free, be prepared to spend some money! If your kids like museums, then my top choice would be Titanic featuring artifacts from the real ship, Natural History Museum and Lied Discovery.